I am not sure what is happening. I did try reinstalling. While playing on the broswer DRM content eventually the computer crashes, and loops (repeating a one half second part) and freezes completely. I am using an x1 and I am running tlp and powertop as one usually does. But not many other things. I also isolated the player on an ICE application and it still keeps happening. It was happening under Peppermint9 and on the respin it just did also. Maybe it is a hardware thing or the ram is flooding, I can't really tell. ive seen the ram go up a bit on firefox but i have not tried setting a limit to ram as a solution. An i7 X1 Carbon... nice! Did I just miss the info on the RAM?! Anyone else has a guess regarding this issue?!! I take it DRM is enabled in Firefox ? Have you tried Chrome instead ? Yes, DRM is enabled in Firefox. thank you. That was silly. It seems to be DRM on Firefox. When streaming something very long it gets stuck (maybe more than an hour). Like a TV series say, without refreshing the page. It does not seem to happen on Chrome. While that is a workaround as pin was saying, it is a bit striking it gets the computer to crash (thanks by the way). My guess is that it blows the ram because it does not refresh it, but still should not be happening. It is the only thing that has made the computer crash. The rest is just a marvel. Hmm... I was only asking. Personally, I don't like chrome or any of its forks. Firefox is the only browser I use. 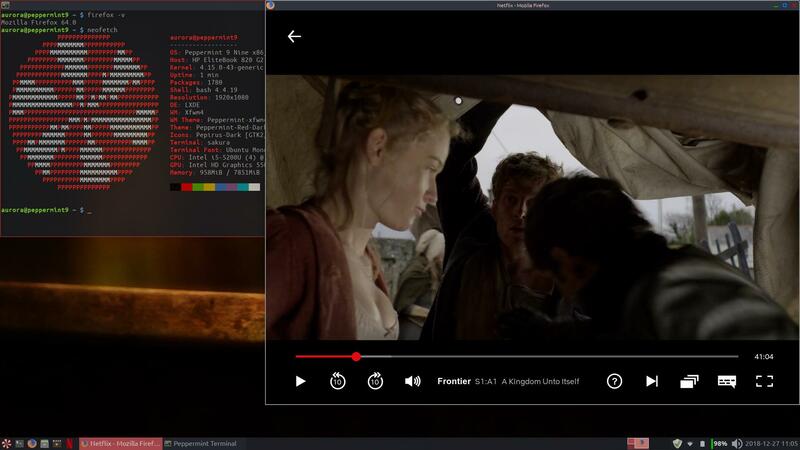 I have an asus i3 with 6GB RAM running Firefox 64 on Peppermint7 and streaming from Netflix works perfectly. My daughter has a hp i5 with 8GB RAM running Firefox 64 on Peppermint9 respin and Netflix is also working without issues. next time the thing freezes? I'm not saying this is a hardware issue, but its strange. I feel the same. I forgot, this one has 8GB. It should be fine. When it crashes I have to turn it off. It loops completely, nothing works. Not keyboard, or anything. I saw the free -m before and it looks normal so I cannot say. Thought it would be worth mentioning the issue. Thank you guys, keep enjoying your holidays. Has it always done this in FF, or is it a new thing (possibly since FF 64) ? Firefox 64 yes. (It updates automatically so I had no idea when it was,). This started happening recently. As I've already mentioned a few posts above, my daughter's machine running PM9 respin with firefox 64 has no issues streaming DRM protected content. She spent slightly more than two hours watching a movie yesterday. EDIT: Probably not important, but thought I would mention it anyway. Only change from default Firefox, "browser.sessionstore.interval" changed from 15sec to 25min. EDIT2: I take you have enough band width?! Maybe a clearout of the Firefox profile (reset to defaults) would help. BE AWARE, this will reset Firefox to defaults, so you will loose ALL customisations/bookmarks/passwords/etc. then start Firefox .. and you should be back to where you are now.